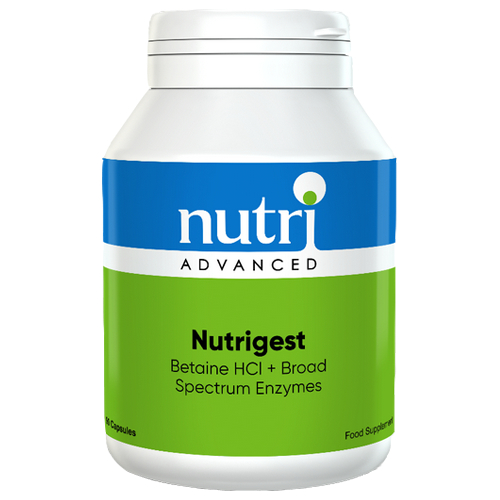 Nutri Advanced Nutrigest is a potent combination of digestive facilitators. The hydrochloric acid (HCl) in Nutri Advanced Nutrigest denatures dietary proteins and facilitates the digestive action of enzymes. HCl also stimulates the pancreas to secrete more digestive enzymes when released into the duodenum from the stomach. 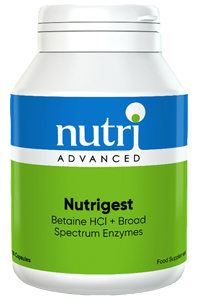 Nutrigest's Pancreatin is combined with pancrelipase providing a mixture of pancreatic enzymes that help break down protein, fats and starches. The Amylase in Nutrigest digests fats and starches while Ox bile helps in the emulsification of dietary fats. Tableted with: Dicalcium phosphate, Microcrystalline cellulose, Stearic acid, Silicon dioxide, Food glaze. Coating (polyvinyl alcohol, talc, polyethelene glycol, polysorbate). 1) United States Pharmacopeia 2) Proteolytic unit according to the FCC (food chemical codex) 3) Gelatin digesting unit 4) Standtedt, Kneen and Blish method.